Spring Brook (also known as Rice Creek) “is the only trout stream in Rice County, and is an uncommon resource type in southern Minnesota” according to the Northfield Natural Resource Inventory (NRI) commissioned by the City of Northfield in 2005. FYI…why protecting our community’s "green space" is important. 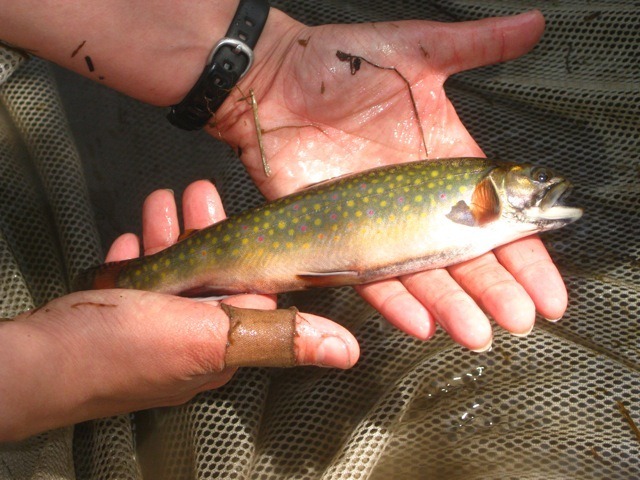 Brook trout only live in those streams without warm water run-off from development, and in those waters which are very clean. A group of students and I went out sampling for brook trout on Saturday, kicking off an assessment of the current population. Attached is a photo of one of our better finds… a 10.5 inch brookie, the largest of the day (I will reveal its location for a small price… maybe). It was a beautiful day to sample a beautiful fish. Here’s a Google map of the area, with a few of my markers. View West Armstrong Business Park (proposed) in a larger map. Here are a couple of Heath Creek and Spring Brook Creek watershed maps from an (old) page on the Carleton web site titled Environmental Aspects of Transportation Planning in Northfield. Previous PostPhotos: Party and parade to celebrate Carnegie Library’s 100th; NAG’s 50thNext PostAre there endangered dwarf trout lilies in the Arb? That 10.5 inch brookie is a beautiful fish! I am still appalled that Northfield would be promoting an industrial park between our creeks when they have already annexed 530 acres north of 19 by the hospital. I do hope Northfield residents will turn up for the open house Thursday (6-8:30 pm) at Community Bank. I wonder if Jay Jasnoch will carry through on his idea of selling T-Shirts for and against annexation at the door. Stephanie, and all Bridgewater supervisors and residents: Please read my comment, #2.1 on the Earth day thread……..
That tool did not work 10 years ago; in the case mentioned, even with the amicus brief support of the National Trust for Historic Preservation, the courts were not ready to take on one of the state’s biggest homegrown businesses, Target… and so the application for hearing at the MN Supreme Court level was ineffectual. But “a lot of water has passed under the dam” ( appropriate, but a pun nevertheless) and everyone is more involved in the success of environmental issues. Read the law… Minnesota Environmental Rights Act.